Toronto- Members of the Estonian Central Council in Canada will be participating in the annual World Estonian Council meeting in Tallinn May 3-5, 2018 in Tallinn. 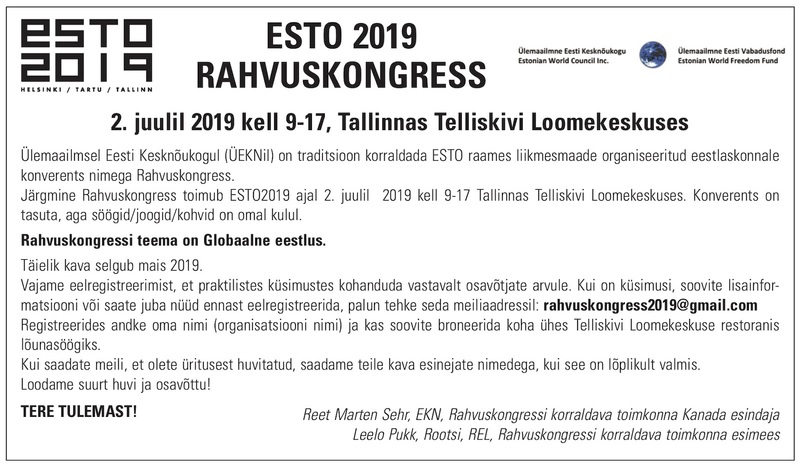 The World Council will be considering policy proposals adopted and first introduced by the Estonian Central Council in Canada, in Fall 2017, urging the Estonian government to improve communications and coordination with the 200 000 Estonians living abroad. The policy adopted by the Estonian Central Council include the creation of 1-2 permanent seats in Parliament, elected by members of the Estonian diaspora. The two members of parliament will be accountable to the global Estonian communities they represent and will be expected to increase engagement among the diaspora. The creation of a Minister’s position or Secretary of State for diaspora affairs, along with staff and an office to support efforts to improve engagement is critical. Estonians are involved globally, at very high levels, in business, culture, tech, finance, sport and many other industries where Estonian can benefit from greater engagement with them. The Estonian Central Council in Canada has worked and consulted with Canadians living in Estonia to develop formal policies, including former former head of the World Bank in Estonia, Hillar Lauri, as well as other Estonian communities. The Estonian Central Council in Canada, also recognizes and appreciates the recent Estonian Government decision, guided by Minister Reinsalu, to build a new international museum and research center into the crimes of the Soviet and Nazi regimes in the historic Patarei Prison complex in central Tallinn.